Well hello to Everyone and Happy Valentines Day. These past few weeks have been a "labor of love". I have been working on special orders and one order was to create gifts that were to be given on this special day. I love the fact that someone wanted to give one of my creations to say "I care". These two new pieces let my client give " flowers" in a new way. 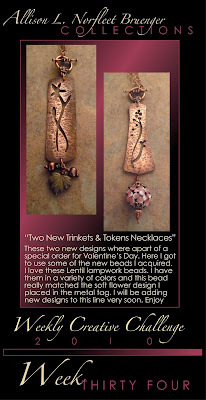 Both of these new "Trinkets & Tokens" necklaces featured a floral motif. I guest you can say "Spring can't come fast enough for me." I also got to use one of my favorite finds from the past year. I love these lamp work beads because of the many colors that they came in and the texture of the bead itself. I think it went perfectly with the texture of my metal tag and gave the piece a very tactile feeling. Well I know I have to get on the ball and create more designs for the "Trinkets & Tokens" line. I've been working on the sketches and will be adding new pieces within this month into the beginning of March. Keep an eye on my new works on www.alnbcollections.com and on this blog. Well have a "Love Filled Day", Wonderful Week and Keep Creating!! !